As President Clinton delivered his nomination acceptance speech at the Democratic National Convention (DNC) talking about “a bridge to the 21st century,” a half a mile away Chicago police were raiding a building housing anarchists from the Active Resistance Counter-Convention (ARC). “I don’t need a search warrant. You’re a subversive and you’re conspiring to overthrow the U.S. Government!” said one of the cops who searched our belongings, while others pepper-sprayed, kicked and threatened us. For three sweaty weeks this summer I worked with AR counter-convention, a ten-day anarchist conference, coinciding with the August 26–29 Democratic National Convention in Chicago. AR marked a big step forward in anarchist/radical organizing and community building in North America. After fifteen years of working on direct action and anarchist campaigns and projects, AR made me hopeful about the potential for a powerful mass movement based on anti-authoritarian principles. The idea for AR came two years prior at a Midwest anarchist gathering, when the location for the Democratic convention was announced. Local activists recognized it-would draw folks to Chicago, providing an opportunity to organize a constructive gathering that would go beyond simply protesting the Democrats. People from across the country, especially the Midwest and Mid-Atlantic, were involved in the planning, with the bulk of the logistics taken on by Chicago Autonomous Zone organizers. AR scheduled most of the Counter-Convention between August 21–25, leaving the August 26–29 DNC period unscheduled so participants could plan and participate in the Festival of the Oppressed, demonstrations or attend the free skool. Mornings activities included presentations about current organizing and activism, time for caucuses and networks to meet, puppet building, and a daily radical dance class. Afternoons were spent in “core” discussion groups divided into three topics: 1) collectives, cooperatives and alternative economics; 2) community organizing; and 3) building revolutionary movements. This was the most ambitious part of AR; allowing for in-depth discussion, planning, and networking to build our oppositional movements and alternative institutions. While the discussions did not completely fulfill-the ambitious goal of “creating an infrastructure for resistance communities,” they did move in that direction by setting a tone and making space for serious discussions about our theory and practice. Some projects and networks came out of the core sections as well as lots of informal contacts, friendships and general community building. Evenings were time for free skool, skill sharing workshops, and presentations and discussions of approximately a hundred different topics as varied as direct action planning, freight hopping, non-monogamous relationships, Zapatista updates, and farming. AR was jam-packed with events and activities: radical history bus tours took participants to important sites, such as the Haymarket Memorial and Emma Goldman’s grave at Waldheim Cemetery, 1880s working class districts, and the area where 1960’s urban rebellions occurred; an evening of revolutionary culture and talks; an Unconventional Film and Video Festival; a tribute to murdered Chicago Black Panther Fred Hampton; a basketball tournament (A.B.A.- Anarchist Basketball Association); and the Propaganda Gallery, an installation of art and images of resistance. There were also moments of unabashed pleasure provided by bands, skinny-dipping at a full moon lake-side party, wild dancing, and great food-provided daily by Seeds of Peace who even brought lunch to the cemetery following the radical bus tour. 750 people from the U.S., Canada, and a few from Mexico and Europe, registered for the event during its ten days. Being around so many people who applied their beliefs day-to-day to their households, farms, collectives, communities, cultural activity and resistance organizing, inspired and activated both fresh and seasoned activists. The convention took place at the United Center on Chicago’s West Side, surrounded by the desperately poor, Horner housing project and a desolate industrial area. Three of the Horner high-rise towers were torn down in anticipation of the convention and their residents kicked out with only temporary housing vouchers. Some local corner stores—the only food supplies around—were also shut down. Chicago’s Mayor Richard Daley orchestrated a major effort to blow away the ghosts of the 1968 Democratic convention. Daley’s dad, the mayor at that time, had ordered the brutal attack and tear gassing of thousands of anti-war activists in the streets outside the convention by cops and National Guard troops. Unlike the 1968 convention, this time thousands of national and international reporters made sure “the whole world was watching” and reading what the Democrats and the current Daley wanted them to. Initially, city officials refused to grant permits for any march during the convention, except ones which would walk on the sidewalks and cross with the lights. To further contain demonstrations which the city was afraid could “get out of hand,” a giant, chain-link, caged parking lot, out of view of the United Center, was set up as the official protest area. However, after a legal battle, the “Not On the Guest List” coalition won a court ruling allowing street demonstrations. Puppet/street theater/mural folks from San Francisco and a mask-maker from Chicago set up an ongoing, week-long mask, puppet and prop building workshop. Over one hundred people participated in making giant puppets, constructing papier mache and cardboard masks and props, and building and decorating a 20-foot-high Corporate Power tower. When completed, we took Our creations and theater into the streets. On Sunday, August 25, a large anarchist contingent, carrying an elaborate representation of the U.S./Mexico border, joined Mexican, Puerto Rican and other activists in an immigrant— rights march. The U.S./Mexico border prop, with flames along the bottom and heads and hands peering through concertina wire on top, was made by Mexican and southern California activists with Ni Estados, Ni Fronteras (No States, No Borders) scrawled across it. We also carried a giant red banner reading, “Anarchist Solidarity, Viva Zapata, No One is Illegal; No Borders,” and a giant rage puppet carried a “No One is Illegal” sign. When the march, joined by one from another neighborhood, entered the DNC protest area, our contingent, unwilling to walk into the official cage, slowly dispersed. On Tuesday, August 27, the puppet procession, followed by a large, lively anarchist contingent (many organized into affinity groups), participated in the “No Justice No Peace” march on the convention to “Protest Clinton and the Democrats’ politics of repression and brutality.” The march was called to “stand up against the racism and classism of the criminal justice system, free all political prisoners, stop police brutality and abolish the death penalty.” We made up a quarter of the 1500 person march organized by the Not On the Guest List coalition. Leaving from Wicker Park, the march went through the neighborhood and towards the convention site two miles away. 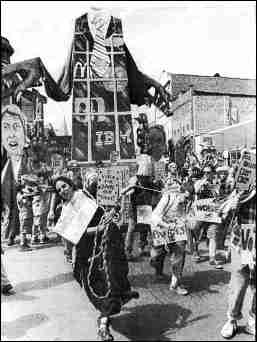 The anarchist street theater procession featured the Corporate Power tower—a combination high rise office building and headless businessman holding giant, ten-foot-high Clinton and Dole puppets on strings. The tower was dragged along by costumed “voters,” “taxpayers,” “workers,” and “consumers.” Its unseen casualties followed behind, including a stump of deforestation, single moms, endangered species, and body bags of health care and education. Puppet police in giant pig heads with their cardboard barricades ordered people to move and mingled with the real cops. Puppet media (See-BS TV) interviewed spectators with a cardboard camera and mike as a TV puppet showed a moving scroll of collaged images. At the height of the procession, people chanting, “Rise up,” rebelled against corporate power and the four walls of the top half of the Corporate Power tower collapsed, unveiling a giant red fist and murals on the backside of each wall illustrating positive future visions. Two ‘giant colorful warrior/goddess liberation puppets flew out and circled the crowd. We staged the uprising against Corporate Power tower as the march came in sight of the United Center. March organizers planned a civil disobedience action blocking delegate traffic into the convention, but police had rerouted traffic. Only Countermedia reporter Jeff Pearlstein was arrested while he was interviewing two kids from the Horner projects. During the Convention the anti-abortion fanatics from Operation Rescue staged actions against women’s clinics. People from AR provided the primary clinic defense, at which a Countermedia videographer was arrested. On the last day of the convention AR organizers scheduled a celebratory street theater procession, the Festival of the Oppressed, through the Wicker Park West Side neighborhood. This was the only anarchist- organized demonstration during the convention, so we decided not to march to the United Center public relations farce, but creatively appeal to the community we were in. As we assembled our puppets in the park, our police liaison, Guin, told a police supervisor we had our own traffic safety marshals and the route would be disclosed as we went. The cop said he couldn’t assure our safety if we didn’t tell him the entire route, but we didn’t expect any hassles. The city had gone to great lengths in their publicity campaign about how well behaved their cops would be, and they had been pretty low key at all the demos that week. We chose a route through the Wicker Park neighborhood’s most visible streets using all the puppets, props and masks we made during the previous week, and a bunch more that Wise Fool Puppet Intervention brought. The procession was led by a ten-foot-high banner with Tony’s incredible AR mural of colorful collaged images of anarchy, community and culture, including a classic graphic of the Haymarket Martyrs. The anti-nuclear Shundahai Network brought up the rear, hauling a giant mock nuclear waste cask, and a high energy drum corps accompanied us. It was definitely a puppet theater procession, not a traditional demonstration with almost no signs or banners in sight. Community response was positive with people coming out of stores and houses to Watch. The police began forcing us off the sidewalk on Milwaukee Avenue, and a line of mounted police pushed us into one lane. Halfway up Ashland Avenue, the cops roughly grabbed a man from Countermedia for no apparent reason. When our police liaison, Guin, went to find out why, the cops tried to push him back. He stood his ground, but was thrown down and dragged away. After a tense standoff, the police line backed up a bit and we pushed forward. Then, a mounted cop charged into the crowd, and his horse crushed the foot of Kristian, one of the marchers. He was carried to the sidewalk where people iced his foot and put him in the Shundahai vehicle. Police stopped the van on North Avenue and arrested Kristian and four others inside. When told that Kristian needed medical attention, a cop dragged him out of the van by his hair, kicking his injured foot as he was thrown into the police wagon. Although Kristian was beginning to black out, they were driven around for an hour. At the police station, Kristian, still blacking out and denied medical attention, was interrogated by nine cops. The van and cask were impounded and trashed, film destroyed, and papers and an address book stolen. Meanwhile, we formed a protective line to prevent the cops from grabbing anyone else. When we turned onto North Avenue, the cops rushed a bicyclist, knocking over other people on the sidewalk. A woman who intervened to protect the man in custody was arrested as were several Countermedia reporters. One videographer had his camera smashed, others had film taken. Even Chicago Tribune reporters complained of police “forming a line to keep reporters and photographers away from the arrests, pushing journalists and threatening to arrest them.” We—took over And held Wicker Park’s central six-way intersection (North, Milwaukee and Damen Aves.) and staged our symbolic uprising against corporate power. We felt the day was a victory since we were able to take the street and carry out our entire march and performance in the intersection despite police arrests and provocation. The procession ended back in the park where we began. After putting down our puppets and props, we formed a circle, planned our responses to the police arrests, and closed with a dance performance. Then, people left for a vigil at the police station for those arrested. That evening, an estimated 100 Chicago police gathered in a dark parking lot near the two sites used for AR conference housing. Word went around to expect a raid. The Spice Factory, the larger of the two sites, was being evacuated and only about twenty people remained at the Ballroom, which had been cleaned out for an unrelated event the following evening. A woman sitting in back of the Ballroom saw eight cops coming up the railroad tracks and yelled “The cops are coming. One of them kicked her in the leg while she was trying to sit up. When she asked, “What are you doing?” the cop responded by pepper spraying her at point blank range. People repeatedly requested a search warrant, and asked for the badge numbers of the police who had removed them from their shirts and hats, but to no avail. Once inside, police searched the building and went through personal belongings. They took a walkie talkie and file from an organizer’s bag including phone lists. As they left, they repeatedly pepper gassed a man at close range, who had followed them from the building. Two people were later hospitalized from the gas. When a reporter asked police about the incident, they denied the raid ever happened and suggested it was invented by AR. After the Spice Factory was evacuated, it was searched and ransacked, presumably by police. Also, on Thursday, police arrested five activists from the Festival of Light, a group including some old Yippies, who staged an encampment at Grant Park and led protests around drug legalization and other issues. They were—charged with felony— mob action and felony battery for alleged actions during the Not on the Guest List march. The police claimed a lone bottle was thrown at them. Chicago activists report a grand jury is being convened to ‘investigate these ridiculous charges. The following day, AR and Countermedia held a demonstration and press conference at the 14th district police headquarters to publicize the raid and arrests, and pressure the police to release those still in jail. Speakers from AR, Countermedia, The National Lawyers Guild, Festival of Light, and the property Manager from whom we had rented the Ballroom and Spice Factory took turns in front of a podium made of a giant puppet of liberation head condemning the police. At the end of the conference/demo, the last two people, Kristian and Guin, were released. The final three days of AR, Friday to Sunday, were severely disrupted by the raid, the arrests, evacuating the Spice Factory and Ballroom and relocating people to a backup space. Although a general weariness prevailed, there was a wrap-up session on Saturday, and the next day, one hundred people met for a final evaluation/next steps session. Since August, people in several cities have held follow-up meetings and regional gatherings are being discussed. A booklet of discussions, reports and reflections about AR is being put together and will be sent out to participants. As of this writing (October 13), charges were dropped on all of those arrested at the Festival of the Oppressed. Contrasted with past continental anarchist gatherings—Toronto in 1988 and San Francisco the following year—our movement has become much more serious, experienced, relevant, clearheaded and widespread. AR planted the seeds and showed us our potential, but only energetic, effective organizing and careful community building where we live will nurture these seeds into thriving communities and a blossoming mass movement. Contact the Autonomous Zone for legal updates or to send money to help with travel/legal expenses: (312) 252–0775 (ext. 2 for legal info), 1573 N. Milwaukee #420, Chicago, IL 60622.